Regardless of scale, shape or weight, LIFT Holdings’ Out of Gauge service actively embraces every change and challenge to meet your specific movement requirements while working collaboratively with you. 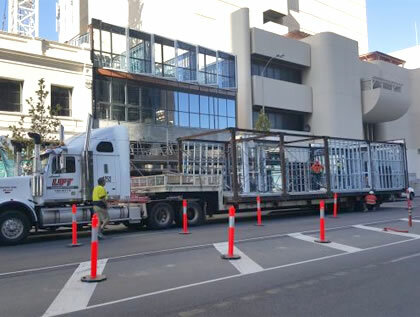 With more than 30-years’ experience in Oil & Gas Logistics, we have the team and expertise to take the time and cost out of your rig move, whether domestic or in-field. We take a full project management approach to planning with services including on-site supervision, heavy haulage, multi-modal transportation, innovative lifting designs and oil field transport engineering. 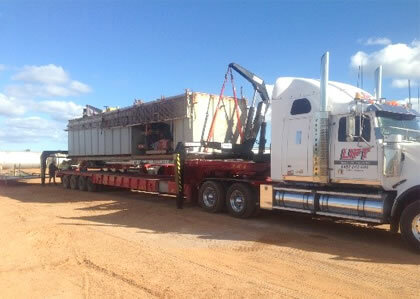 Designed to put your mind at rest, these customised side loaders are specifically built for the rig move process. They are ideal for camp moves and for most rig shifts. The bridge leg design enables single lift transfer and units can extend to 50ft to allow for the safe lifting of most components. 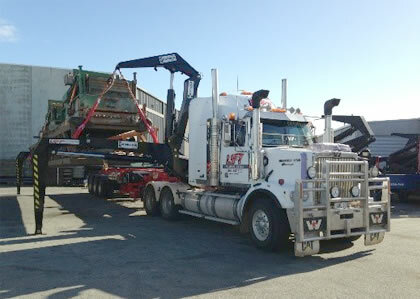 At LIFT we specialise in the movement of awkward, oversized and overweight cargo, from metro to the middle of Australia. We can customise heavy-duty trailers to accommodate your load and we continually update our knowledge of the conditions that could affect the transport of your unique shipment. Our focus is on always on providing you with a reliable, safe, efficient and thorough service.